Vital things I try to keep in mind in practice and matches. 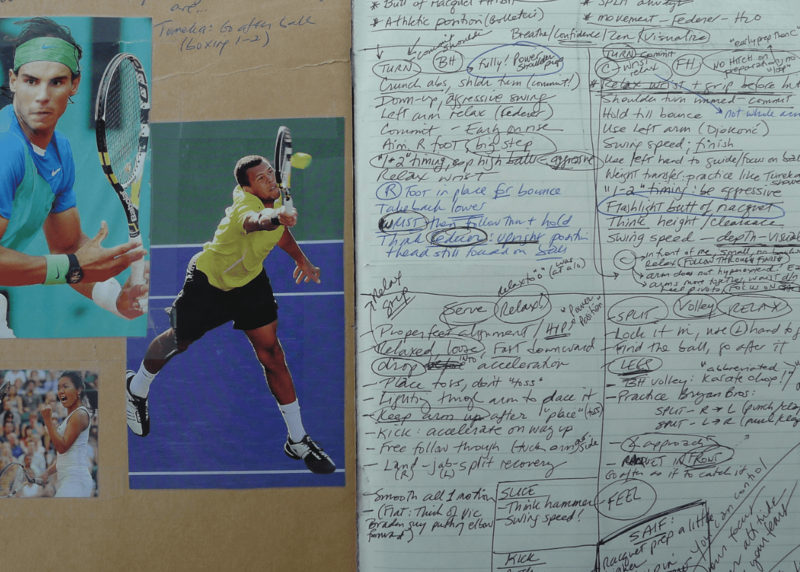 Until I started this blog I was keeping notes of lessons learned in a tennis journal I’d carry around in my bag, which as you can see from the photo below was getting a little out of hand (a Feb 2012 photo of my journal’s front-page “summary”). This page is my attempt to organize the clutter electronically into a running list of key “Reminders to Self”– vital things I try to keep in mind in practice and matches. I tweak it often. Note: Keep in mind that I’m a righty when you see references to my “R” or “L” arm/side. Act confident, use positive body language even when I’m feeling down on myself. As Jeff Greenwald has pointed out, if you start “acting the part” even when you’re not feeling great, you’re more likely to feel what you’re acting. Stay grounded, bend the knees, athletic position. Nick Bollettieri said on one of his videos, “Good things happen to players who bend their knees.” Remember how much power comes from the legs. Be sure to “stay with your shot” long enough (think “One thousand one”). Keep the head still. Think Federer, whose head stays still and relaxed upon impact. Keep racquet speed up–don’t push the ball: When things aren’t clicking, my tendency used to be to “push the ball.” Not anymore. Now I think about generating more spin and accelerating through the shot. Breathe. Critical to rhythm and to eliminating tension in the body (and mind). Embrace the “good” mistakes. Go easy on yourself when things aren’t perfect. Give yourself credit for “good mistakes” that are helping you move in the right direction. During points: “Watch the ball, Move your feet, Trust your swing… Focus on INTENTION–where you want to place the ball–not stroke mechanics…” Saif Syed and Yann Auzoux have reinforced this great advice to apply before matches, which also is a good reminder to bring into practices when I’m tight. Be grateful for your ability to be playing at all. Put things in context. * Is your wrist tight? Relax it. * Are you seeing the “fuzz/seams” of the ball? * Are you decelerating and “pushing” the ball? * Are you bending your knees? * Are you finishing the swing and “staying” with your shot? * Stop thinking about technique and VISUALIZE the outcome you want. Then just do it. Visualize a winning trophy position; remember this involves relaxed opening of the shoulders towards the back of the court (think Jeff Salzenstein’s “elbow the enemy!“), which is a key to getting maximum power. (Think “bow and arrow” position too during the loading/cocking phase). Racquet drop position is NOT “scratch your back” like you were told as a beginner (terrible advice). It’s along the right edge of the body and racquet comes up on edge to set up properly for pronation. Practice shadow swings with mirror, or back fence, slowly until feels natural then increase speed. Also practice trying to come up on edge and hit ball with edge of the racquet. Hit UP with fully extended arm at point of impact. Think of shoulder “rolling over” as Nick Saviano talks about. 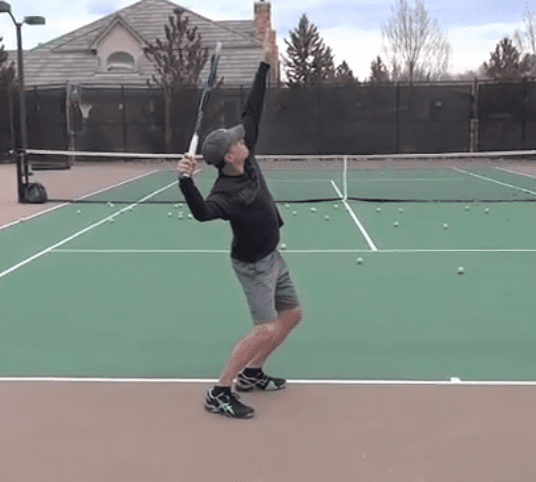 Keep upper body facing towards R net post a little longer. Power doesn’t come from rotation in serve. Toss around “12:30/1:00pm” and more into the court and go after it! Practice serve and volley drill to make sure momentum going INTO the court. Let it rip through the finish – don’t decelerate upon impact! Stay grounded! Knees bent. Don’t pull up on the shot. Racket all the way back!! 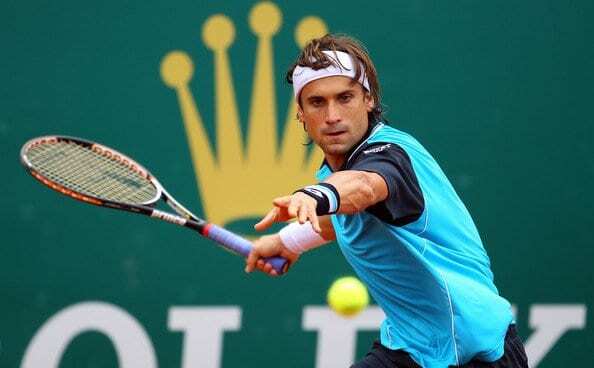 Keep elbow somewhat close to (and slightly in front of) body on FH side so arm can only move forward on the volley. But keep it loose: don’t want to be robotic. Meditate on the ball as your opponent tosses, and watch what happens to it.